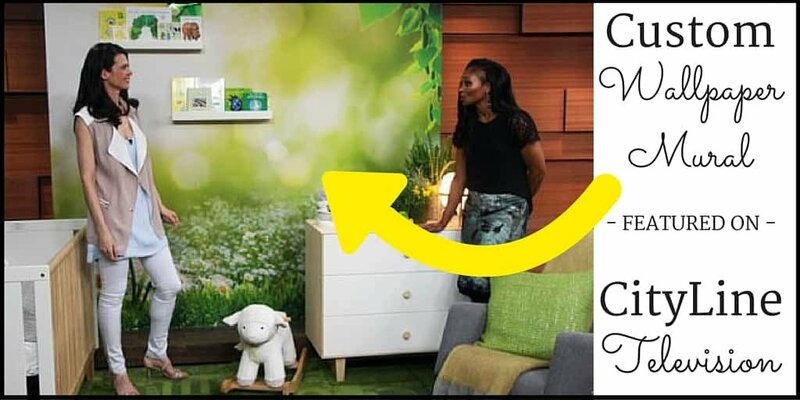 Custom wallpaper mural for nursery featured on TV! The murals I sell were featured on TV again! Tracy Moore, from CityLine Television, talks with Interior Designer, Celia Alida Rutte. Celia created a baby nursery inspired by bringing “true” nature indoors as opposed to the vinyl wall decal or cartoon images. The mural with the daisies in the background is a custom mural created by my supplier, MuralUnique. It was created with a stock image found online…sort of like the one below from iStock. If you have a stock photo in mind for your wallpaper mural, that’s great. If you just have an idea…but need help finding the photo…I’m here to help! I can do the legwork in finding the perfect image just for you! She talks about the custom wallpaper mural by my supplier, MuralUnique, around 1:05. That’s what Celia had to say and it was the inspiration for her theme. The biggest part of this video for me, though, was about the environment. As a mother, I am always trying to find ways to make the earth better for my daughter to grow up in (and maybe grandkids one day!). One of the reasons I chose to work with MuralUnique are their commitment to being green. A Custom Wallpaper Mural For You? Have an idea for a custom wallpaper? Get started on a custom wallpaper of your own! What “green” factors are most important to you when choosing decor for your home? Or is it important to you at all? I’d love to hear your opinions in the comments below!